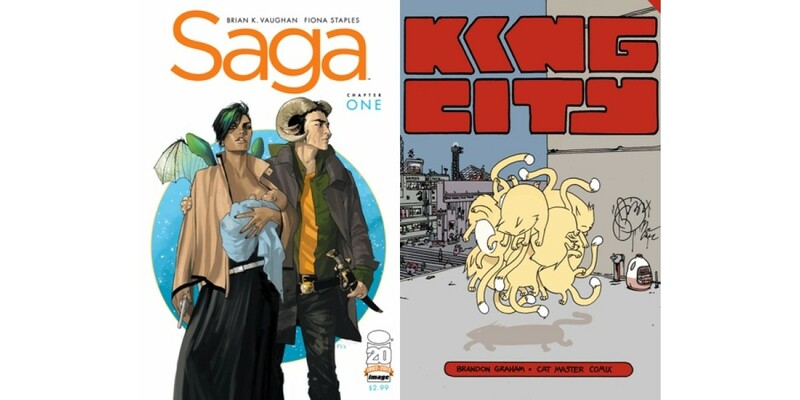 Image Comics joins the comic book industry in congratulating Brian K. Vaughan, Fiona Staples, and Brandon Graham for their Eisner Awards, received Friday night in ceremony in San Diego.SAGA by Vaughan and Staples, the hit family drama-meets-space opera, won awards for Best New Series, Best Continuing Series, and Best Writer — every category it was nominated in. Graham’s expansive and inventive science-fiction graphic novel KING CITY received the Eisner Award for Best Graphic Album – Reprint. Vaughan has previously received four Eisner Awards. These are the first Eisners Staples has won in her career, and SAGA is the first ongoing series she has drawn. Brandon Graham’s Best Graphic Album – Reprint Eisner Award for KING CITY was his first Eisner win. KING CITY had previously been nominated for an Eisner in 2007. Dave Stewart, colorist on FATALE, also received the Best Coloring Eisner Award, for his work on seven titles, including FATALE. Image Comics titles received eighteen Eisner Awards nominations this year. SAGA was competing against three Image Comics titles in the Best Continuing Series category — FATALE by Ed Brubaker and Sean Phillips, THE MANHATTAN PROJECTS by Jonathan Hickman and Nick Pitarra, and Rob Liefeld’s PROPHET, written by Brandon Graham and drawn by Simon Roy, Giannis Milonogiannis, Farel Dalrymple, and Brandon Graham. It was one of four Image titles nominated in the Best Writer Category, along with FATALE, written by Ed Brubaker, THE MANHATTAN PROJECTS, written by Jonathan Hickman, and MULTIPLE WARHEADS and PROPHET, both written by Brandon Graham. Image earned two nominations in the Best New Series category, thanks to FATALE and SAGA. Brandon Graham alone received four nominations: Best Writer, Best Graphic Novel — Reprint, Best Cover Artist, and Best Coloring.